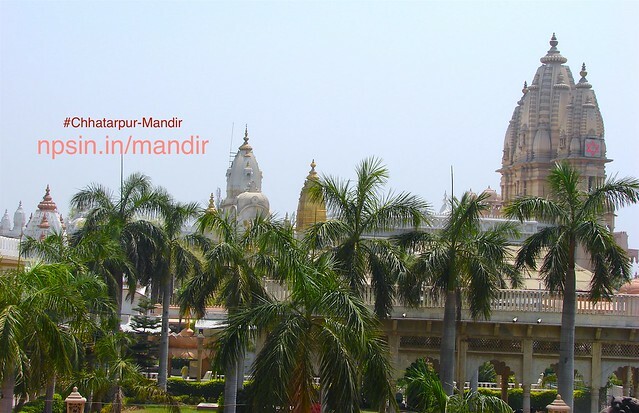 छत्तरपुर मंदिर (Chhatarpur Mandir) a group of temples like Maa Katyayani Mandir, Shri Laxmi Vinayak Mandir, Baba Jharpeer Mandir, Markandeya Mandapam, 101 feet Hanuman Murti. Temple popularly known as श्री आद्या कत्यायानी शक्ति पीठ मंदिर (Shri Adya Katyayani Shaktipeeth Mandir) During Navratras ceremonies such as Hawan, Rudrabhishek, Durga Saptshati Path, Ramayan Path, Rath Puja, Lungar Puja are performed round the clock. Energy Audit for electricity consumption revision and Rain Water Harvesting achieved by 12 rainwater recharge pits including two dry wells. A Group of Temples in 70 Acres Area. Most Famous Spiritual Place for Gupt Navratri. Second Largest Temple Complex in India. Rain Water Harvesting System Enabled Campus. 101 Feet, Second height Shri Hanuman Murti in Delhi NCR. This auspicious day is celebrated on the fagun shukla purnima (February/March). In the morning, Babajis statue is offer a holy bath (Kumbhabhishek) and there is a continuous recital of the following mantra for 24 hours. All the devotees play Holi at the Markandeya Hall which is followed by lunch including other Cultural and religious programmes held over the day. Babaji attained Samadhi on 15 December 1998. On this day the Samadhi is decorated with flowers and lights, Bhajans-kirtans and Abhishek are held at the Samadhi.